Here we go again. Stocks took another nosedive Tuesday following more fears about a slowdown in China's economy. The Dow Jones Industrial Average plunged 470 points, or 2.8%, and is 12.5% below the all-time high it set in May. The S&P 500 fell 3% and is once again in a so-called correction. It's down more than 10% from the record that it hit in May. Only three stocks in the S&P 500 finished the day higher -- Cablevision (CVC), American Airlines (AAL) and chemical company Sigma-Aldrich (SIAL). The tech-heavy Nasdaq sank nearly 3% as well and is 11% below its July peak. 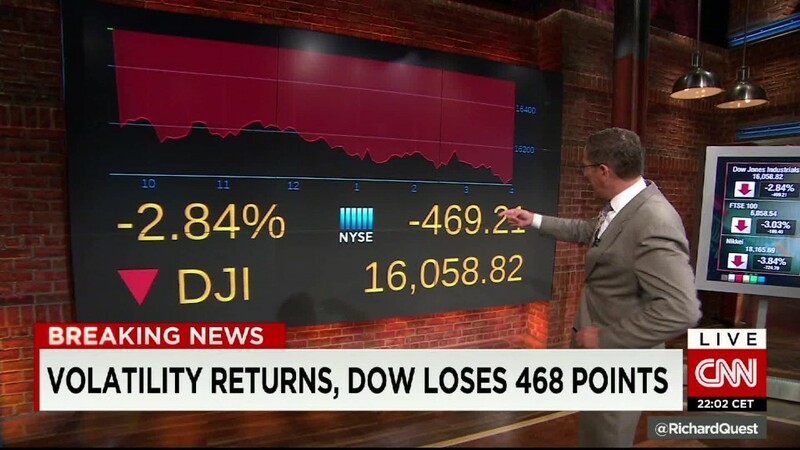 The Nasdaq also lost its gains for the year Tuesday and is now 2% lower in 2015. And it comes after the market suffered a miserable August. The Dow had its worst month in more than 5 years while the S&P 500 had its biggest monthly drop since May 2012. Weakness in China, the world's second-largest economy, is a major concern for traders. Two separate reports that came out Tuesday morning showed continued sluggishness in China's manufacturing sector. The IMF also warned Tuesday that China's slowdown will have an impact on the rest of the global economy. Shares of U.S. companies with big exposure to China -- Apple (AAPL), mobile chip giants Qualcomm (QCOM) and Avago (AVGO), KFC owner Yum Brands (YUM) and Macau casino operators MGM (MGM), Las Vegas Sands (LVS) and Wynn (WYNN) -- all took a noticeable hit Tuesday. Oil stocks fell sharply as well as crude prices tumbled 7%. Oil prices spiked dramatically on Monday on hopes of production cuts after OPEC said in a report that it was "ready to talk" to other oil producers about how to stabilize prices. An oil supply glut is the main reason crude prices have fallen off a cliff during the past year. But fears about slowing demand from China have put pressure on oil as well lately. So any new fears that hint at more weakness in China will likely put more pressure on oil and many other commodities. To that end, oil giant ConocoPhillips (COP) announced it was cutting about 1,800 jobs Tuesday and cited the "dramatic downturn" in the energy sector as the reason. It didn't help that a key gauge of manufacturing in the United States also missed Wall Street's forecasts Tuesday. The ISM manufacturing index for August fell from July and hit its lowest level since May 2013. But on the positive side, construction spending in July grew at a higher rate than expected. Still, the global market turmoil and mixed bag of U.S. economic data may further complicate things for the Federal Reserve, which will meet in two weeks to discuss whether or not to raise interest rates. Worries about when the Fed will finally hike rates, which it hasn't done since 2006, have also weighed on market sentiment. Rates have been near zero since December 2008 and there are fears that many traders won't be able to cope in an environment where the Fed is boosting rates. Investors will have a better sense of what the Fed might do after the U.S. government reports the August jobs figures on Friday. Strong payroll gains and a pickup in wage growth could keep the Fed on track to raise rates this month.